This Easy Christmas Crafts Paper Doily Cone Ornament is fun and easy to make and is reminiscent of Victorian Candy Cones. These ornaments use simple materials and tools and are quickly finished to hang on a tree, a door knob or on a chair. 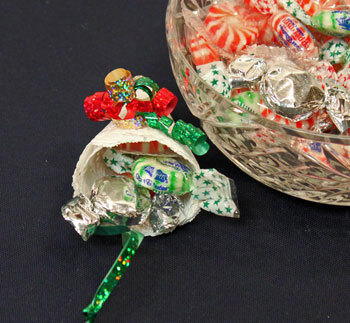 Each paper doily cone ornament takes a small paper doily, several pieces of curling ribbon and candy (or something else) to fill it. Take a look at these three finished Easy Christmas Crafts Paper Doily Cone Ornaments hanging on the tree. 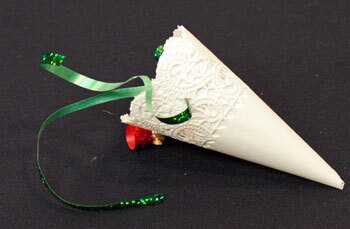 The paper doily cone ornament is simple yet elegant. With different ribbons and contents, each ornament can be unique. 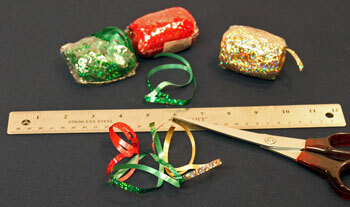 Measure and cut the four 12-inch lengths of curling ribbon. For this version, I used three different colors; red, green and gold; for the front of the doily. The fourth ribbon for the hanging loop was green. Examples below show using one color of ribbon. Fold the paper doily in half with the wrong sides together. 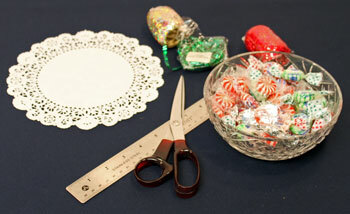 Bend the paper doily in half again and make a small crease just at the center of the doily. 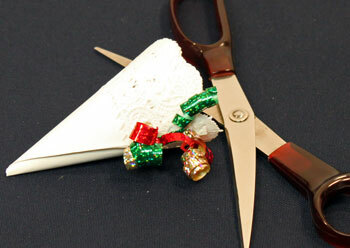 Form the point of the Easy Christmas Crafts Paper Doily Cone Ornament around the center of the doily. The edges should meet with one inside the cone and one outside. The clothespins are not necessary, but they come in handy for photography or if you need to put down the project for any reason. Select three of the four ribbons. Thread them through the doily's holes in all thicknesses on both sides of the seam of the cone. 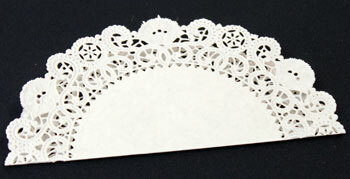 Each side of the seam has four thicknesses of paper doily. Pull the ribbons firmly but not too tightly. If you pull too much, the ribbons will cut the paper doily. 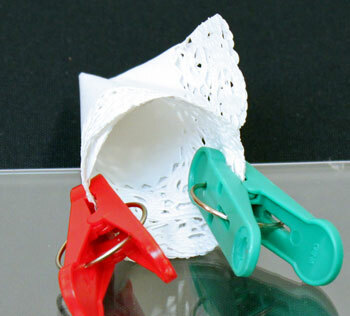 Tie a knot in the ribbons near the Easy Christmas Crafts Paper Doily Cone Ornament. With the edge of the scissors, curl each of the six ribbon ends. 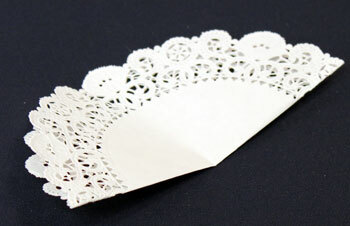 Thread the fourth ribbon through all four thicknesses of the back of the paper doily cone ornament. The back is opposite the curled ribbon. Pull the ends of the ribbon even and tie a knot to make the hanging loop for the Easy Christmas Crafts Paper Doily Cone Ornament. 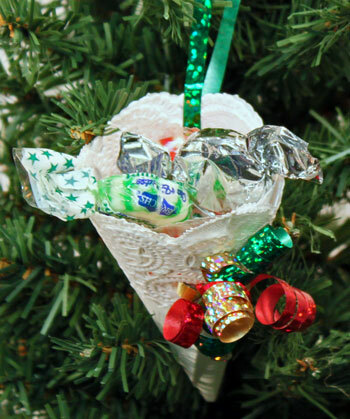 Fill the paper doily cone ornament with candy, nuts, a small toy or something fitting for your holiday season. Hang your finished Easy Christmas Crafts Paper Doily Cone Ornament on your tree, a door knob, a chair or anywhere you want to hang your ornament. 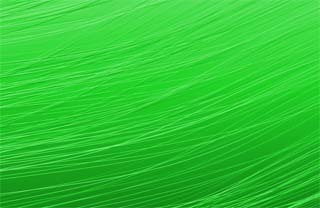 This example used four pieces of green curling ribbon rather than different colors. Also, the ribbon ends were split after the curls were made. This next version of the Easy Christmas Crafts Paper Doily Cone Ornament used all blue ribbons and a larger doily. With just a little time and a few inexpensive materials you can add simple and pretty decorations to your home. 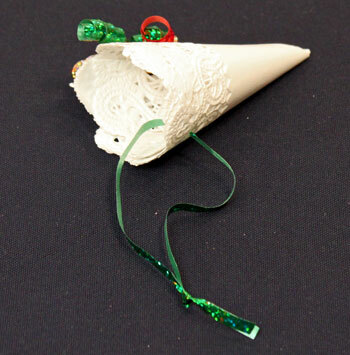 Plus, this Easy Christmas Crafts Paper Doily Cone Ornament can also double as a gift hidden in plain sight on the tree. 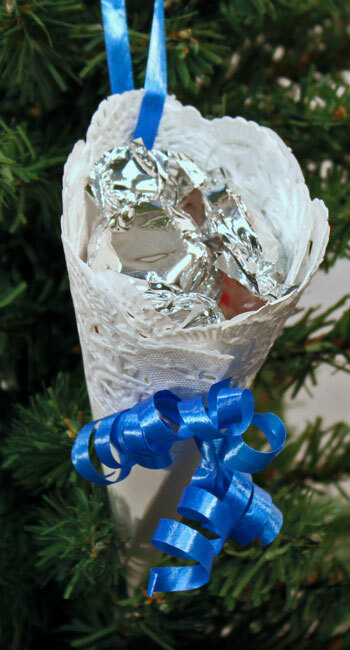 You can place small gifts in the bottom of the paper doily cone before placing the ornament on your tree. 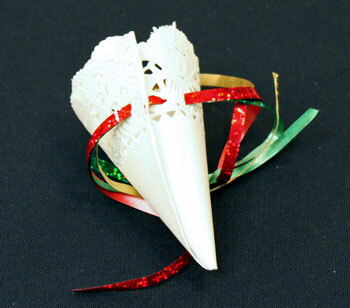 This Easy Christmas Crafts Paper Doily Cone Ornament could easily hold cash or a promissory note as a gift. Many people would cherish a gift of your time and effort in helping them with some of their more difficult or ornery tasks. You can write a promise on pretty paper, roll the paper and place it in the bottom of the cone. 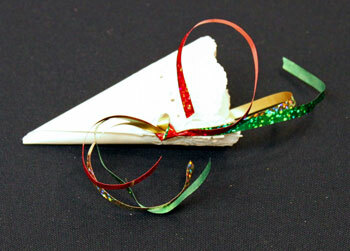 These simple and inexpensive cones could also be party favors for guests at your holiday party. They could hang on a party favor tree in a foyer. They could hang on a dining chair. Or, they could be placed at each dinner setting. These ornaments are inexpensive in both money and time. They offer fun and easy enjoyment for children and adults alike. Both simple and pretty, this Easy Christmas Crafts Paper Doily Cone Ornament is easy, fun, and inexpensive for anyone to do.